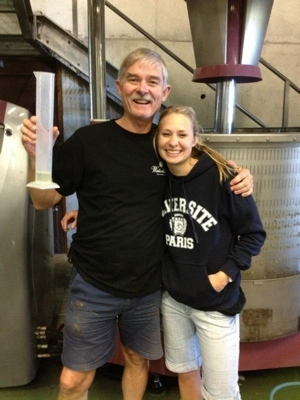 Our harvest report on the 2013 vintage is in. The verdict? Phenomenal. The harvest started particularly late due to prolonged winter conditions, followed by a cool spring, which delayed budburst by 7 to 14 days. The first few weeks of crush were fast and furious, with Sauvignon Blanc, Chenin Blanc and Chardonnay arriving at the winery often on the same day. After two vintages with smaller crops and more challenging weather patterns, 2013 is proving to be generous in regards to quality, but unfortunately with lower yield in the Helderberg region. We experienced ideal weather conditions during the harvest season: Moderate day temperatures, cool night temperatures, and no prolonged rain or heat waves. This all had a positive impact on the grape quality, establishing good colour on the reds and lovely acidity on the whites, with balanced flavours. The grapes were healthy, with a bit of rot occurring later in the season. The spontaneously fermenting juices from each of our vineyard blocks are stunning, and the combined aromatics that have engulfed the winery are an exciting promise of the final blend to come. While it is customary for us to choose only the best blocks for the Waterkloof ranges, this year’s elimination process will certainly prove challenging, as there are no step-children in the group! The last of our grapes only came in at the beginning of April, having rested longer on the vine, to ensure optimal quality with an elegant tannin structure.